Three Red Cross refugee support volunteers have found the cultural exchange with the family they've been supporting is one of the most enjoyable parts of their volunteer experience. The El Masri's and their volunteers enjoy sharing their cultures with each other, especially through food. It's a dreary Saturday afternoon, but that doesn't seem to bother 6-year-old Baraa El Masri who is curled up on the couch with Red Cross volunteer Matt Allen. They're reading Princess and the Frog while Baraa’s younger brother, Moustafa, rides one of his sister’s tricycles around the room and the oldest sibling, Nagham, plays video games. Over on the next couch, another Red Cross volunteer, Jessie Moss, bounces baby Shahid on one knee and her own daughter, 2-year-old Irihāpeti, on the other. Meanwhile, Hannah Ferens, the third of the El Masri’s Red Cross volunteers, is in the kitchen, helping the children’s mother, Nariman, prepare an elaborate lunch for everyone. The trio has been friends, mentors, and guides to the El Masri family for more than a year now. Mounir and Nariman took their kids and fled their Syrian home in Homs after war broke out in 2016. They registered as refugees with the UNHCR in Lebanon and spent several years awaiting resettlement. Finally, in 2016, they were told that they’d be starting their new lives in New Zealand after being accepted as part of the country’s refugee quota programme. It was around this time that Jessie, Hannah, and Matt were driven to become Red Cross refugee support volunteers after seeing the crisis in Syria worsen. “We live in a global society now,” says Jessie. 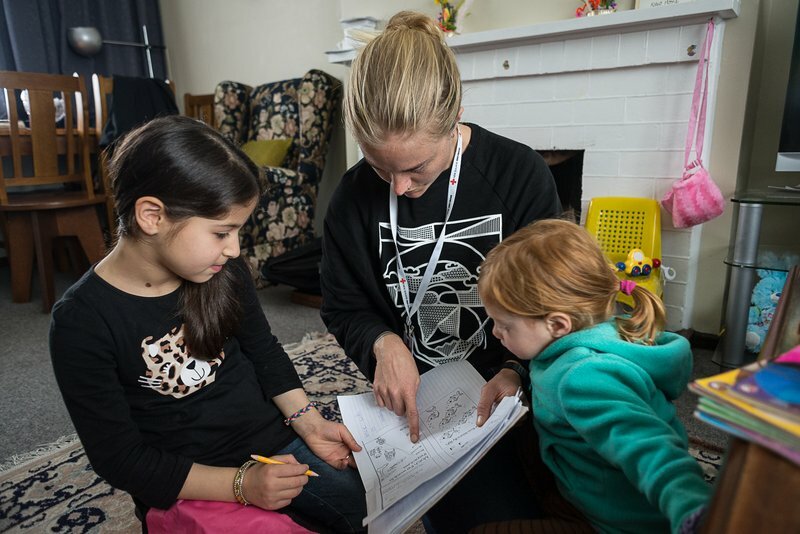 The three of them completed their volunteer training and were connected with the El Masri’s when they arrived in Wellington last June. Since then, Hannah, Matt, and Jessie have provided valuable support to the El Masri’s through their first year here and provided the link that has helped them navigate life as Kiwis. The support has paid off with the group becoming firm friends, often getting together to share a meal or a cuppa. “We eat lots of food together and I think we’re equally keen to introduce each other to new cuisines and tastes,” says Jessie. Today, Nariman lays out a hybrid lunch of Kiwi and Syrian favourites: pizza and handmade chips with ketchup, Kibbeh (a Syria meatloaf dish with sauce), tabbouleh, and flatbread. The kids dig in, devouring both cuisines with gusto and a mixture of languages echo through the house with people switching between Arabic, English, and Te Reo. It’s this cultural exchange and friendship that the volunteers have enjoyed most about their involvement in the El Masri’s resettlement, although watching the family flourish has also been rewarding. “The children have opened up and they are friends with many of their neighbours,” says Matt. “The whole volunteer experience has given us more than we expected,” says Hannah.